Gary Wilson hit six boundaries in a top score of 45 as Ireland cruised to a five-wicket Twenty20 win over Papua New Guinea in Townsville on Saturday. 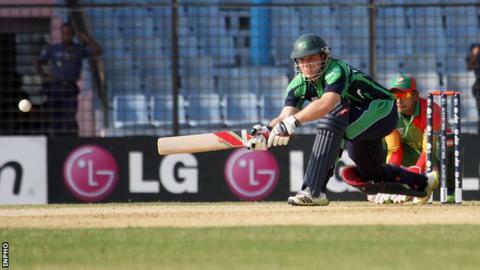 Ireland were 30-3 before a stand of 53 between Wilson and O'Brien (19) helped them to 97-5 in just 12.1 overs. Wilson scored his 45 off 33 balls in the one-sided affair in Australia. "It felt good when I was out there - I've been hitting the ball nicely so hopefully I can continue that form for the rest of the tour and beyond," Wilson told Cricket Ireland. "It was a comfortable chase in the end, even though we lost a couple more wickets than we should have at the end of the innings. "The bowlers set the tone very well, hitting the deck hard. The pitch was a little two-paced, so getting them for a low score was key."